Move Over Watson, there’s a new AI bot in town! 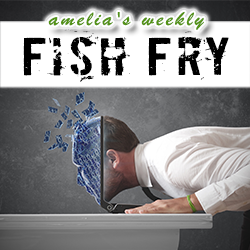 In this week’s episode of Fish Fry, artificial intelligence takes center stage. Did you know that two “dialog bots” at Facebook’s artificial intelligence lab created their own language? In the first part of our AI-themed podcast, we take a closer look at this new language and investigate why FAIR (Facebook Artificial Intelligence Research) shut the language down as quickly as it was created. Also this week, we chat with Kevin Yapp (Avnet) about Ask Avnet – the world’s first “AI-to-Human Digital Platform.” Kevin and I discuss why Avnet created the industry’s first digital platform to integrate artificial intelligence and industry expertise, and how engineers can get involved with the development of this beta program.